Adding to the ever-strong Summer Uprising lineup, Doom and Destiny is the fifth of twelve titles. In this broad selection, there’s bound to be at least one let down, and I’m sad to say, this may be it. Now, this review is coming from a person who has never properly experienced a JRPG (unless Pokémon counts), and that’s because I just cannot get into them. So I suggest, before or after reading this review, read a few others too, since this may not be coming from the most experienced person. D&D is the story of four nerdy friends looking to play their favourite table-top adventure, which suddenly becomes all too real. Dragged in to a fantasy world full of clichés, the ‘heroes’ set out on a journey to unveil the evil plot of ‘The Unnamed’. Well, that’s what the game wants you to think. Throughout, you’ll lose grasp of the games incoherent storyline, most of it getting lost in translation with the unending banter between the characters, and occasionally funny jokes and parodies thrown in left, right, and center. But, clearly story isn’t the main focus of this game, and the gameplay mechanics certainly make up for what it lacks in sense. The mechanics used aren’t so different from a standard JRPG, which is probably why the core gameplay works so well. You walk, run, loot everything, level up, and get random encounters which throw you right in to the heart of battle. As per usual, you fight using your magic, or your current weapon, reducing the enemies health bit by bit with each of your four characters. In the midst of battle, you can choose to speed things up: holding down the right trigger will run everything much faster, as well as automatically selecting each character’s moves as the standard ‘attack’. This little feature comes in very handy, with the countless enemies you encounter on your travels, you quickly become tired of battling, and simply want to get things over with as soon as possible. 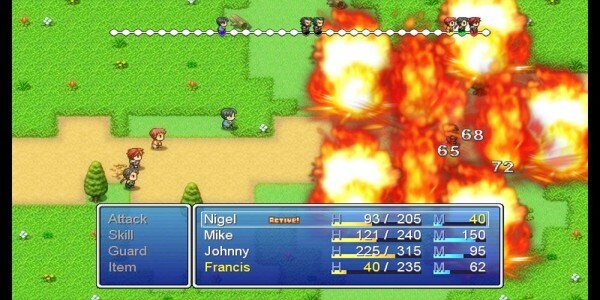 Many modern JRPG’s should take note of this, it’s a great feature that really benefits the player. After each enemy kill, your characters will gain XP, which of course leads to levelling up. With each level you increase, the character gains three skill points to spend on their skills. Spending these is crucial, and making each character well rounded, or highly specialized in one area, such as critical hitting, or speed, can make for some very interesting tactics in battle. The game looks average at best. 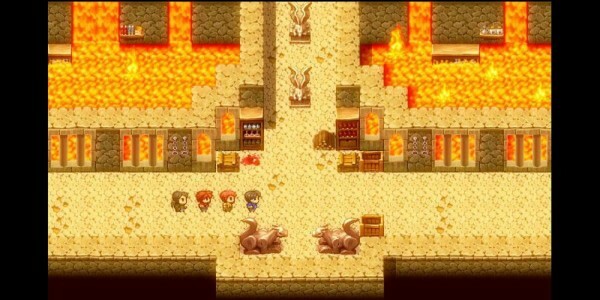 Created using ‘RPG Maker’ software, it is nothing you’ve not seen before. Though everything flows well, and is well designed, D&D gains no praise in this area for basically using something that’s already been made for it. D&D is huge, I mean seriously huge for an indie game. To complete the game with minimal, necessary exploration will take you at least 10 hours, and each part of the map is re-accessable, so if you put in the time an effort, you won’t miss a thing. 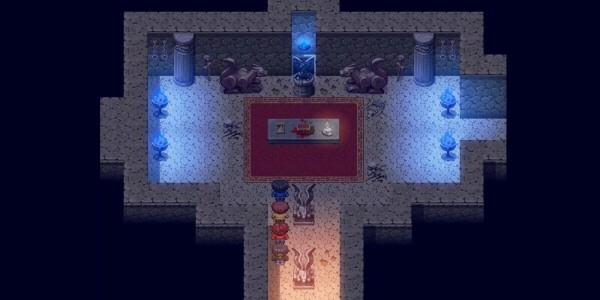 Overall, Doom & Destiny is a pretty average 8-bit JRPG, with little differing from the norm. It’s vast world is bound to keep you occupied for hours, and you’ll most definitely get a laugh out of some of the witty jokes thrown at you throughout. For the price of 240MSP, you couldn’t ask for it to be more jam-packed, and is a must buy for anyone who wants to try a JRPG without splashing out.